A big gardening goal for me this year is grow all of my plants from seed. In my quest to reduce cost's for my family, starting my garden plants from seed is a logical choice. Of course, there is that little nagging thought in the back of my head, wondering if I'll blow it. Tomatoes and peppers are difficult to grow in our cooler summers and I've never had much luck with peppers at all. However, armed with many seed catalogs I spent many an hours in January making lists and comparison shopping. I choose to order with Territorial seeds as they are based here in Oregon and it would be nice to support a more local company. They also had a nice variety of choices for plants that grow best in our climate. I also purchased organic fertilizer (I do to make my own again this year as well) and indoor growing propagators. 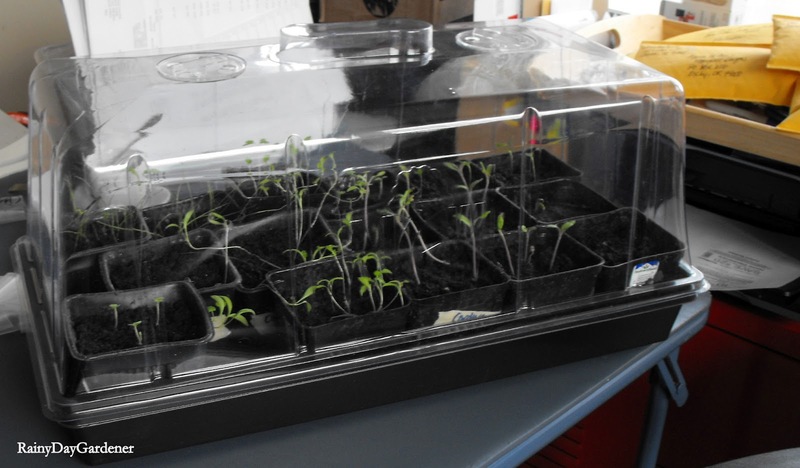 After reading a great article by Mark over at Mark's Veg Plot, I was inspired to purchase a propagator with a higher dome lid so that plants could reach a more mature age indoors, then be transplanted. This is my little propagator. I've sown many herbs along with tomatoes and peppers. One variety of pepper is only just beginning to sprout, even after been in there for over a month. As I've never undertaken this kind of project on before, it is difficult for me to tell if things are too leggy or not. Knowing my luck, they're too leggy. I plan to start another propagator with more warm loving veggies later this month to compare growth and possibly have more starts should these not work out. For a list of what I planted, visit my Veg Plot 2012 page. I am most excited about growing more basil. I have enjoyed my homemade pesto so much this past winter. My goals for future seed sowing is that I feel confident enough to grow heirloom varieties, with the intention saving seeds. 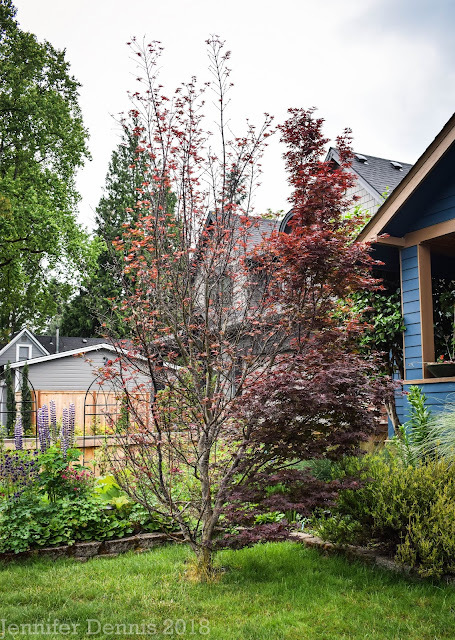 This year, with our big move and home renovations, I felt that going with more hybrid varieties would be prudent, as they tend to not need as much attention. Good for you for trying to start your own! Don't be discouraged! Some of them do look quite leggy. When they flop like that, that's a sign. Do you have lights that you can lower down to just above the plants? Do they have bottom heat? Tomatoes and peppers sprout better with heat. I had great success last year growing tomatoes in a hoophouse, which isn't hard to make. You also might want to repot those leggy ones as soon as they get true leaves, and when you repot them, fill the dirt up all along the leggy stems (so you will need deeper pots). Ha do you know what my biggest problem is with seeds?! I can't decide which to order and I procrastinate because I don't want to make my list smaller but in no way can I grow all those seeds can I?! I'd love to grow more of our food so that is my goal this year. You can grow tomatoes, which ones did you try? This year I am trying Black Krim as I've been told repeatedly the black tomatoes do well in our cooler weather. Can't forget a cherry tomato as those always seem to do so well. Light is the answer to reducing legginess but if the seedlings do grow leggy just try planting deeper when you prick them out. We have found the long carrot shaped peppers are easier than the bell peppers. Thanks Sue, I'll keep that in mind for my next purchase. I'm trying a mini-bell as well. It however, is having the most difficult time sprouting. I find the hardest thing about growing from seed is where to put all the containers. My sun room is filled with pots for about two months before they get planted out. I put up a portable shelving unit to help hold them. Its also tough hardening off the plants. About a week before I plan to plant any given plants outside, I carry them outside for the day and then bring them inside for the night - this gets a bit tiresome. On the plus side it saves so much money and is very rewarding growing from seed. Hope you have lots of success! This is my second year using grow lights indoors and they do make a difference. I know that space is an issue and I transform a couple of shelves in my tiny laundry room for a few months to grow plants. My biggest problem is keeping them watered as the novelty wears off quickly for me since I thought I'd be moving more of them outside by now. I hadn't seen a propagator with such a tall cover before, that is really nice! New House Files, Part 3: Plant Hoarder?